This morning I’ve seen a really lovely blog post and discovered the wonderful Geoffrey and Grace. The blog covers everything from Vintage shopping, makes, family life and interiors so it’s a lot I can identify with! Thank you for your kind words. Glad you enjoyed the post. It’s a great room, nice to be able to share it with people. This entry was posted on February 11, 2014 by antiqueowl in Online owling, Owling at home and tagged Blogs, colour, modflowers, owling at home, retro, vintage fabric. Rainbow Vintage Home: Curtain de-stash! Guest blogging elsewhere… Little Flea! 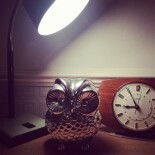 Owling about town: Chop Chop! All copy on this blog remains the property of Samantha Villis. Please ask permission copying or re-blogging. I dont bite. Images are my own unless otherwise stated. I try to give credit for images whenever possible.